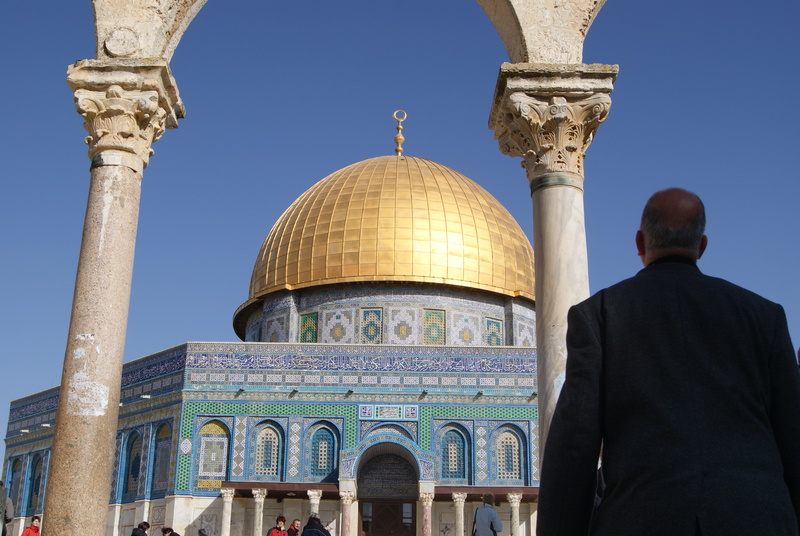 It’s hard not to be captivated by the Dome of the Rock in Jerusalem. 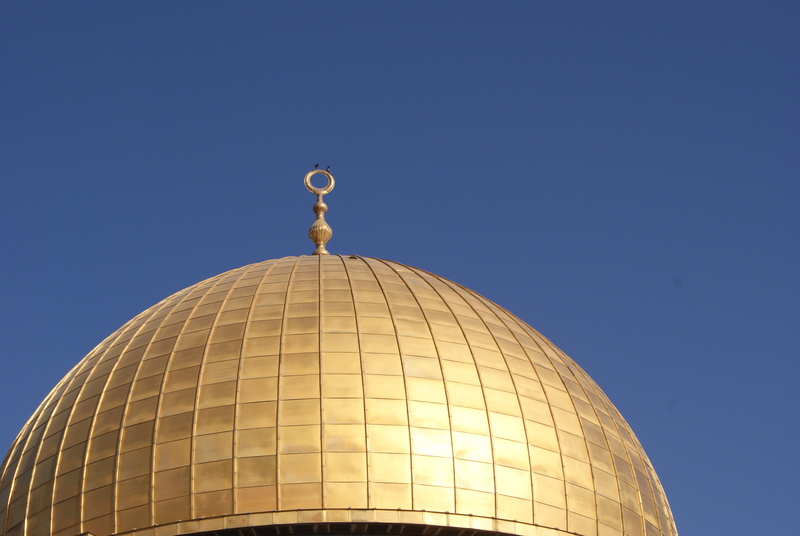 The stunning gold dome and blue tile stand out boldly against the creamy white Jerusalem stone everywhere else, and its beauty is unparalleled in the city. I was fascinated before I even arrived. 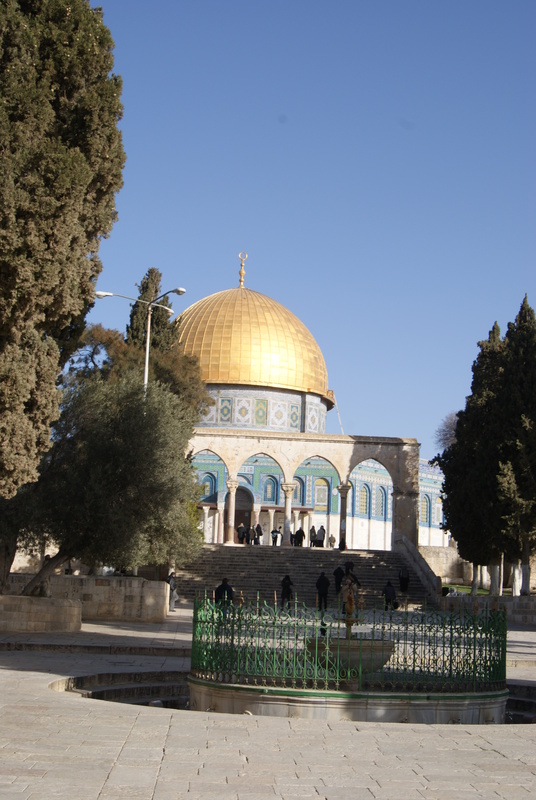 Having read so much about the history of the city, I had attached all kinds of sacred meaning to the historic Temple Mount, now known as the Haram al-Sharif, or Noble Sanctuary. This giant platform hovers over Jerusalem, its activities invisible to those below except for the shiny gold of the Dome of the Rock. This “high place” has a long and tangled history as a holy place. Although there is no archeological evidence and some scholarly debate, many believe it was the original site of Solomon’s Temple. It was definitely the site of the Second Temple, built by Herod the Great in the first century before Christ. 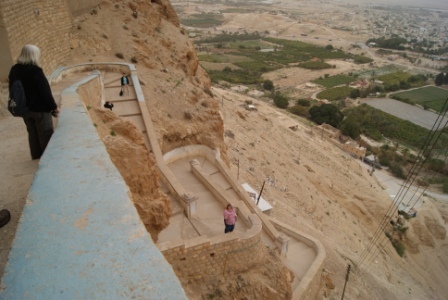 Herod took a natural hill and extended it out with fortified walls into the 35-acre platform that still exists. In 70 CE, the Romans destroyed that temple as part of their attempts to quash Jewish uprisings. The only thing remaining from Herod’s magnificent temple is the Western Wall, which was one of the walls of the platform, not the temple itself. In the Byzantine era, the Christians ignored the remains, and even used the platform as a dump. View of the Haram al-Sharif from the Mount of Olives. 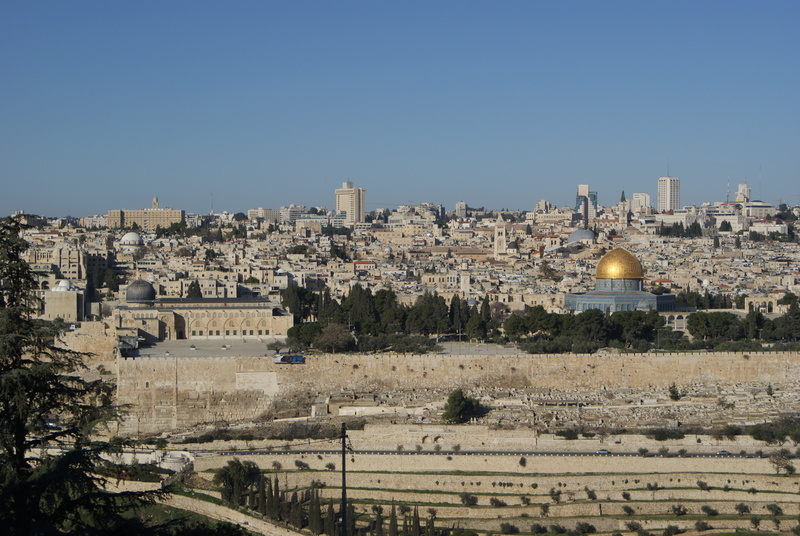 The small gray dome on the left is the al-Aqsa Mosque. When Caliph Omar conquered the city peacefully in 637, he recognized it as a holy site and cleaned it up as a Muslim shrine. He adopted the Jewish tradition that the large outcropping of rock was Mount Moriah, site of Abraham’s near-sacrifice of his son (Isaac or Ishmael, depending on your faith tradition). He also began the tradition of the Temple Mount as the site of Mohammed’s night journey to Jerusalem, making it the third holiest site in Islam. Omar built a small wooden mosque at one end of the platform, the original al-Aqsa Mosque. 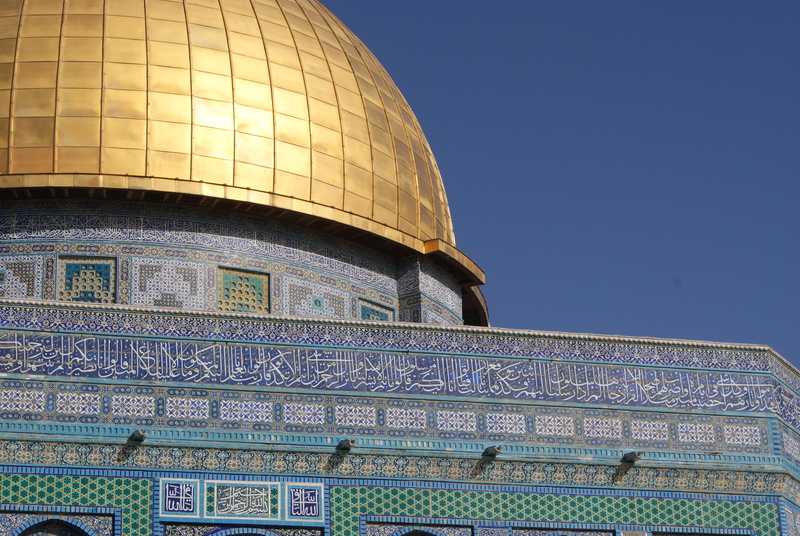 Caliph al-Malik built the Dome of the Rock at center of the platform in 691, enshrining the rock outcropping. It has been restored and rebuilt many times. With the exception of the short occupation by the Crusaders in the 12th century, the Haram al-Sharif (the name of the whole platform, which means the Noble Sanctuary) has remained in Muslim hands and cared for as a holy site. Aerial view of the Haram al-Sharif, showing the gardens and smaller buildings surrounding the Dome of the Rock. 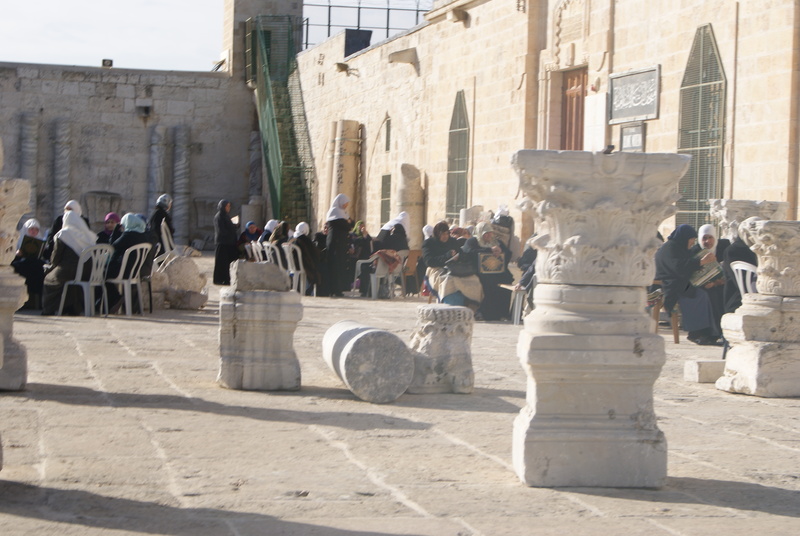 Unlike all the other sacred sites in Jerusalem, it is forbidden to wandering travelers. You must pass through extra security to enter, and non-Muslims are only permitted on the Haram al-Sharif for a few hours in the morning. The rest of the time, it is reserved for prayer for the Muslim community. I had not realized before our trip that it was open to visitors at all, so I felt privileged and amazed to walk around and see it with my own eyes. Security to enter the Haram. On the left, security to get to the Western Wall. On the right, to the Haram. The Haram itself was a beautiful array of buildings, gardens and fountains. The beautiful Dome of the Rock is at the center, and the oft-rebuilt al-Aqsa Mosque takes up the southern side. On the surrounding sides are an array of smaller buildings used as Qur’anic schools and administration buildings, along with several smaller shrines and statues. The whole place did indeed feel like a sanctuary. 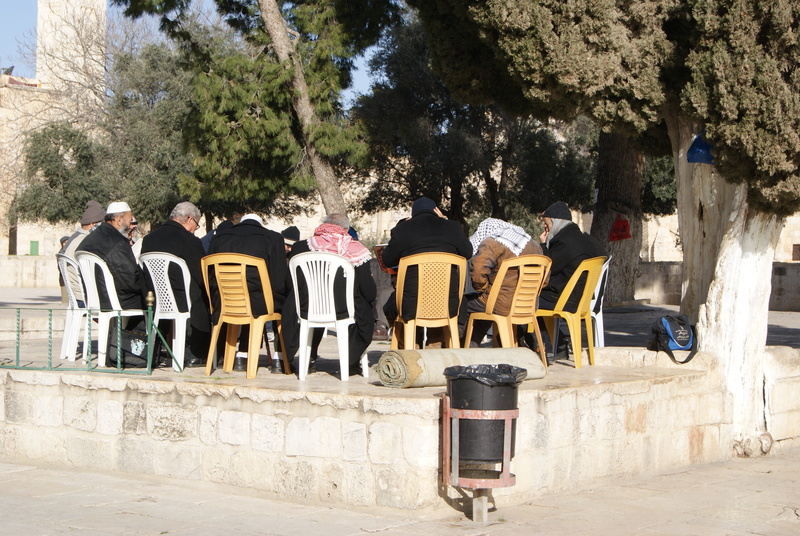 Gathered in small circles on plastic chairs, separate groups of men and women sat studying the Qur’an and praying together. The trees and the gardens, the buildings and the people invited peaceful attention to the glory of God. Unlike the gawdy gold domes on many state capitols here in the U.S., the ornate blue tiles and reflective gold dome did not feel like an ostentatious display. It was the crown jewel of the city, the most beautiful human space to complement and glorify the beauty of God’s presence. A group of men gathered at another spot on the Haram. These small gatherings made the whole platform feel like a church campus. We were met by Dr. Mustafa Abu Sway, a scholar of Islam at al-Quds University and a friend of one of our leaders. 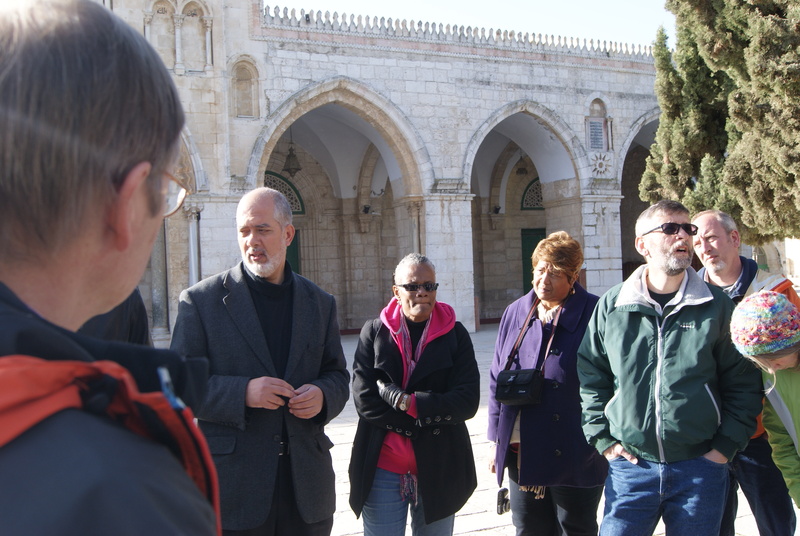 He gave us a rich insight into the history of the holy place, but what stands out in my memory is the perspective he offered on the present realities of Muslim life in Jerusalem. The Israeli police have confiscated more and more buildings on the Haram, for use as security outposts. Although the site is Muslim property, there are uniformed, armed police everywhere. The government has instituted age limits for permission to worship at the mosque on Fridays (the Muslim holy day). The age limits vary between 40-50, and they are always announced on Thursday evening. No one under that age is able to come to worship at the Haram. Israeli security claims this is an effort to prevent demonstrations and violence. Palestinians must have a special pass to enter Jerusalem at all. In 2008, the government revoked the rights of more than 4,500* Palestinians to enter the city. Many of them were lifelong residents of Jerusalem, and lost their employment when their passes were revoked. Even more, they lost their right to pray and worship at the Haram. Dr. Abu Sway told us about the bureaucratic tangle of building permits for Palestinians in Jerusalem. For Jews, a building permit is easy to obtain and costs less than $2,000. For Palestinians, the process takes many years and costs over $30,000. He and his wife finally got permission to build a home for themselves after five years of waiting for a permit, and their home was to be built on land that his wife’s family had already owned for many years. Many of his friends have become impatient with the permit process and constructed homes without a permit. Just a few weeks back, one of his fellow professors had his home of ten years demolished when the authorities discovered it was built without a permit. As non-Muslims, we were not permitted to enter the Dome of the Rock or the al-Aqsa Mosque. This has nothing to do with Islamic custom, attire, theology or anything else. Always in the history of Islam, non-Muslims have been welcome to enter any mosque, and even to pray there in their own tradition. However, the holy spaces on the Haram have been closed to non-Muslims as an act of solidarity with Palestinians in the West Bank, who are forbidden from entering Jerusalem and praying there. The leaders of the community felt that it was unfair for non-Muslims from across the world to have access to this sacred site when faithful Muslims a few miles away were denied the right to pray and worship there. Listening to these stories, I felt even more grateful for the opportunity to visit the Haram at all. It felt like an act of gracious hospitality to open the Noble Sanctuary to visitors, even in a limited way. It was indeed a forbidden space, a place of mystery to many—to Orthodox Jews who are not allowed to enter because rabbis have declared it too sacred; to Muslims in the West Bank denied the right to pray in their own holy place; to Christians and tourists too intimidated by the security restrictions; to all those faithful pilgrims so caught up in their own holy sites that they do not venture into the holy site of another faith. When the Psalmist writes about the tribes going up to pray together in unity, this is the glorious mountain of which he or she speaks. Dr. Abu Sway said that, before the restrictions, more than 400,000 people would gather on the Haram for Friday prayers during the last week of Ramadan. Imagine such a mass of people gathering at one place in peace. Imagine the nations of the world, with their many names for God, coming together to pray as one. This is the spot where the Psalmist imagined it could happen. The faiths of Jerusalem exist side-by-side, shoulder-to-shoulder, yet we cannot yet unite our voices in prayers and in peace. Pray for the peace of Jerusalem: “May they prosper who love you. *Corrected number: I originally remembered this as 400,000, instead of 4,500. Thank you to Dr. Abu Sway for the correction. See a link with more information in his comment below. Today was our free day in Jerusalem. Apart from morning prayer and evening prayer, we had no obligations for the day, and we were free to explore on our own. While some in our group were eager to take in new sights, I felt overwhelmed by the rich experiences so far. I needed solitude, silence and space more than anything. The one thing I did want to see was the Garden Tomb, so I walked a short distance from the hotel with a group first thing in the morning. 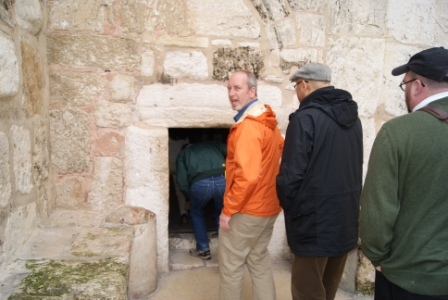 The Garden Tomb was the discovery (invention?) of Major General Charles George Gordon, a British general in the late 19th century. Whether from historical doubts or simply dislike of the Orthodox and Roman Catholic Church of the Holy Sepulchre, he identified an area on the east side of Jerusalem, near the Damascus Gate, as the “true” site of Golgotha and the tomb of Jesus. 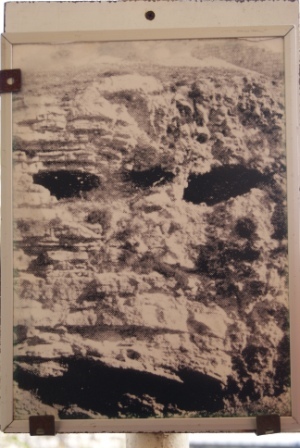 The rock face does look a lot like a skull, even though it is currently covered up by a bus depot. 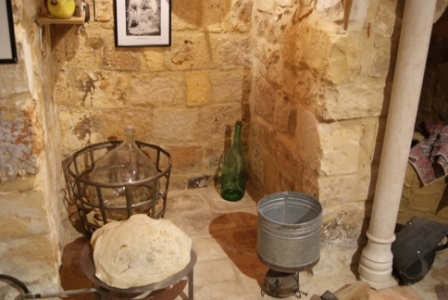 There is a tomb there, and quite a large one, along with a large cistern and Roman-era wine press. 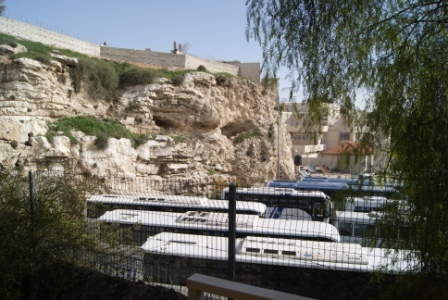 Scholars have since expressed major doubts about this site as a possible true location for Jesus’ crucifixion and burial, but the site still attracts major groups of pilgrims from across the world, especially Protestants. Yet still I wanted to come. Yet still they want to come. 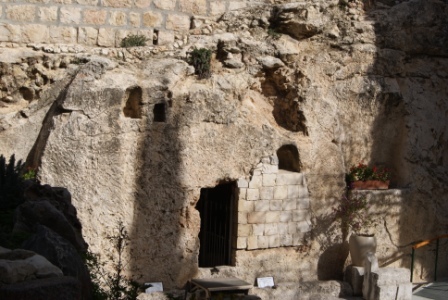 I suspect that their reason is the same as mine—whether or not the Garden Tomb has any historical or archeological connection to Jesus, it still looks just like I always imagined Jesus’ tomb would look. The site may not fit history, but it fits the picture in my head. The caretakers of the site have transformed it into a luscious garden, with multiple gathering spaces for tour groups. They offered our small, disorganized band the opportunity to celebrate communion together—they provide the elements, we perform our own liturgy. Unlike the noisy, jostling competition at the Church of the Holy Sepulchre, the Garden Tomb was quiet and invited solitude, rest and contemplation. Although it was no less man-made than the Holy Sepulchre, it was like an Olmstead park, designed to look natural and create a sense of peace and communion with the natural world. I loved it. I don’t know what it actually looked like when Mary Magdalene mistook Jesus for a gardener outside the tomb, but this is what I wanted it to look like. One of my favorite parts of this visit was our tour guide. A Methodist pastor from England on sabbatical, she made me feel like we were getting a tour from the Vicar of Dibley. There is reason to be cautious, of course, when holy sites conform too readily to our expectations. In some ways, the Garden Tomb felt like a Walt Disney production, designed to make all those who entered feel like it was the “happiest place on earth.” Its conformity to all my fantasies made me doubt it even more, and question what those fantasies said about me and my theology. Yet it offered me a great deal of solace to contemplate the resurrection story taking place in this beautiful, tranquil location. As I have been saying throughout this trip, it’s not about what may or may not have happened here 2,000 years ago (or more). It’s about connecting the ancient story to the presence of the living Christ in our midst. 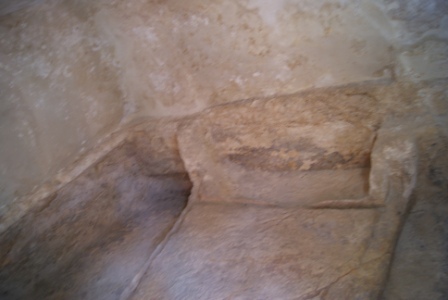 The beauty and serenity of the Garden Tomb gave a visual aspect to my faithful imagination of the resurrection story. 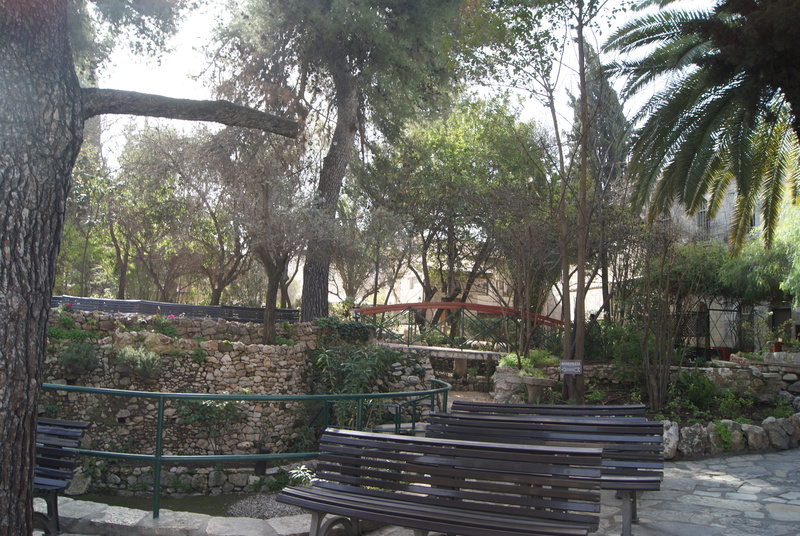 The area surrounding the Garden Tomb was simply beautiful and serene. From there, one other member of the group departed for the other side of the city. He wanted to walk the Via Dolorosa, and I wanted to revisit the Church of St. Ann, which is at the start of the Via. 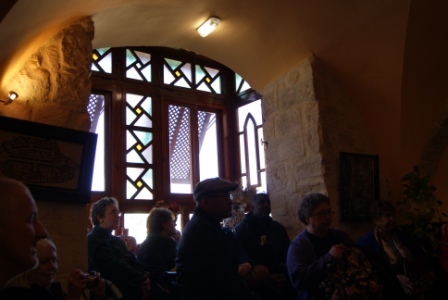 When we were there on our first day in Jerusalem, we sang as a group. People urged those of us in the group with strong singing voices to take our turns at a solo, but I was not ready. In the moment, I felt like my voice wasn’t ready, and that it would feel too much like a performance and not enough like prayer. Still, I was haunted from the time we left by the desire to sing Mallotte’s “The Lord’s Prayer” in that space. It felt like an offering I needed to leave in that place, so I returned with only one companion. Since I was a little girl, I have sung songs to God as my most intimate form of prayer. Even now, I will go to the church I serve when no one else is there, just to sing into the silence of the sanctuary. It felt like such an amazing gift to be (almost) alone in such a busy place, with tour groups filing in and out. My voice was far from perfect, because I was battling a cold at the time, but the space was so resonant it sounded full anyway. As the song worked through to its high notes and climax, I kept my eyes closed, but I could hear the scuffle of feet as people entered the sanctuary. Even in those few seconds, I could feel the tension—should I stop and make room? I didn’t want to perform for people, could I just quit? I decided that this was my offering, my prayer, and I should finish what I had begun. When I opened my eyes, there were three Greek orthodox priests in full beards and vestments standing a few feet away, looking stern and surrounded by a large group of pilgrims. I quietly slipped to my seat, and they proceeded forward to sing and pray an entire short service together. I listened with delight to the echo of their strong chants from the rafters, the murmured prayers of the faithful circling the walls, still a bit nervous from having been overheard in my own song. When they finished, I bowed my head as they began to leave, trying to be inconspicuous. Suddenly, one of the stern-looking priests tapped my shoulder, “Bravo! Bravo!” he practically shouted, grinning widely and surrounded by gestures of approval from all the pilgrims. One of the last, an older gentleman, asked me if I was Czech. I told him I was American, and found out they were Bulgarian. My companion left to continue down the Via Dolorosa. Even though my mission was accomplished, I felt such a sense of peace and joy that I did not want to leave. One by one, more groups came and went from the chapel, and I sat and listened to their songs. A group from Malaysia sang “How Great Thou Art” and the doxology. 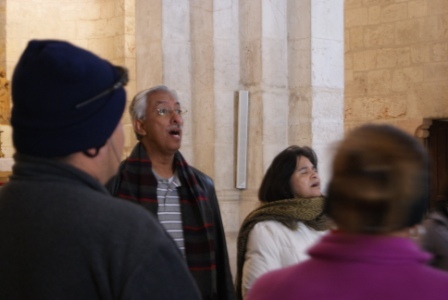 A group from Texas and Mexico offered “Sing Alleluia to the Lord,” and “Alleluia, Alleluia” in English and Spanish. Two members of the group began a duet in Spanish with many verses. Everyone else left, but they continued singing. The tour guide returned to urge them on once, twice, three times—but they concluded their song without leaving. A German group sang one tune I recognized, and one I did not. An English group sang “Amazing Grace,” with all the verses. When I knew the songs and they sung in English, I joined my voice to theirs. Otherwise, I just sat and listened. My soul reached a deep level of bliss in that place. From all over the world, people came and made their offerings in many languages. 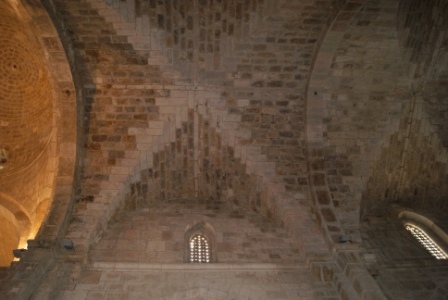 I meditated on all the prayers and songs those walls had heard, reflected and absorbed over the centuries. The sanctuary itself is simple and plain, with grayish white stones stacked high. Its true beauty is only made known when people come inside and begin to praise God. The acoustics take over, and even mediocre voices are transformed into glorious praises. After nearly two hours there, the priest and I were the only ones left. He told me that the groups were finished for the day, but invited me to stay for as long as I desired. Alone, I returned to the front of the sanctuary and began to sing again—a reprise of “The Lord’s Prayer,” “It is Well with My Soul,” “I Love You, Lord,” and more. My songs were my prayer, from a place of deep joy and ecstasy in praising God in that place. Soli Deo Gloria. I found space, solitude and silence, but I also found music and movement and beauty. Thanks be to God. 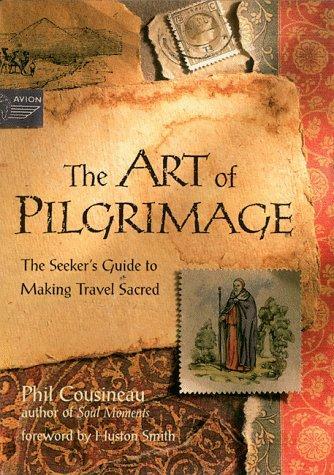 The Art of Pilgrimage: The Seeker’s Guide to Making Travel Sacred, by Phil Cousineau, Conari Press, 1998, 254 pp. I purchased two books on pilgrimage before my trip, to read along the journey. I wanted this journey to be more than exciting travel—I wanted to encounter the Spirit there. As you can see if you’ve been reading the posts surrounding this one, that hope was more than fulfilled. Cousineau’s book offered the right insights and provoked the right questions to open me to the pilgrimage experience. Through storytelling from famous pilgrims, mythical travelers and ordinary people, Cousineau walks through the various stages of the pilgrimage experience. First, there is longing—the inward desire to see the world differently, to be challenged and changed, to find themselves anew and live life more fully. Then comes the calling and the departure, followed by more about the way of the pilgrim. Unlike tourists, pilgrims travel with intention, with the desire to see the sacred in every moment and discover meaning in every encounter. As such, the practices of reflection, walking, reading, writing, and being present in time become as much a part of the journey as the sights themselves. Cousineau uses the metaphor of the labyrinth to understand the pilgrimage journey, inviting pilgrims to get lost in the deep places of their spirit, including room for brooding. I read this chapter just after Day Ten of my pilgrimage, and I connected with the struggles he described as a part of the transformative nature of the journey. At the center of the labyrinth is the arrival, the experience of arriving at that sacred place, both inward and outward. I especially appreciated the final chapter, “Bringing Back the Boon.” Cousineau recognizes that a pilgrimage is not just about the pilgrim. If we are given the opportunity to be a pilgrim, it is not just for ourselves—we have a mission responsibility to return back and share what we have learned and experienced. There is work to be done when we return to help us remember the journey, and all that we learned. I feel like I am doing that work now—looking at pictures, completing blog post reflections, reading and reflecting, preparing to share with my congregation. Cousineau’s book is an excellent resource for anyone who is interested in moving from a tourist to a pilgrim, and yearning to make their travel a more sacred experience. Pilgrimage doesn’t require a journey halfway around the world. You can engage a pilgrimage spirit for a trip into your own backyard. Cousineau will help show the way. After the deep emotional and spiritual work we had been doing on our first few days in Jerusalem, all of us were relieved for a day of recreation in the desert. The day’s agenda included a trip to Qumran (where the Dead Sea Scrolls were discovered), swimming in the Dead Sea, a cable car ride to the Monastery of the Temptation, and exploring the Tel as-Sultan in Jericho. All of these destinations were fascinating, but they did not carry such a burdensome weight of spiritual history. I was ready to engage the day with the joy and delight of new experiences. 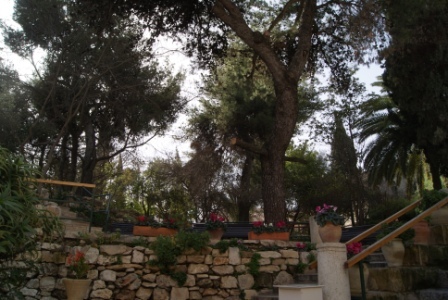 We drove out of the city by going over the Mount of Olives, which is 2600 feet above sea level. In less than 20 miles, we dropped nearly 4000 feet—the shores of the Dead Sea are almost 1400 feet below sea level, the lowest place on earth. Our ears were a-popping! 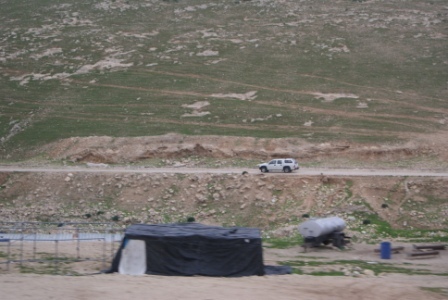 On the way, we again took one of the new roads built by the Israelis to facilitate Jewish settlements in the West Bank, which ran like a direct highway into the Judean wilderness. Our driver, Talib, pointed out that Palestinians were not allowed to drive on this road, but used the old Roman road that wound through the towns of Bethany, Bethphage and more. Everywhere you go in Israel/Palestine, you are confronted with the struggle over control of land and property. A truck with Palestinian plates drives parallel to us on the Roman Road, unable to use the new highway. 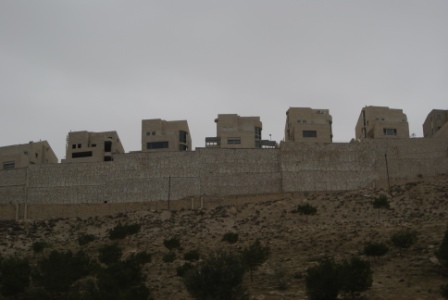 An Israeli settlement in the West Bank. 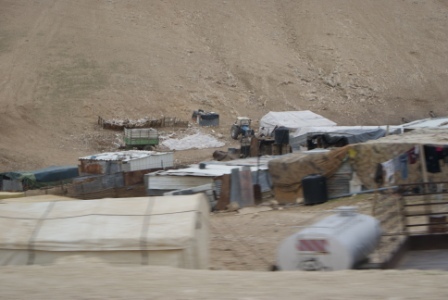 We also saw many Bedouin encampments along the way. Israel has given the Bedouin citizenship rights, but demanded that they settled down from their nomadic practices. The encampments we saw in the Judean wilderness were rudimentary, although we saw evidence in the Galilee of towns and schools built especially for Bedouin communities. The major cultural shifts away from nomadic life among the Bedouin have not come easily, and poverty is in evidence everywhere. 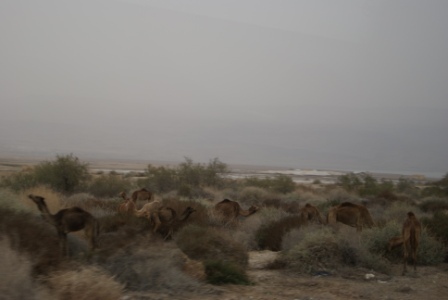 The highlight of the Bedouin territory, especially for those of us who are the parents of young children, were the camels. There were camels everywhere! They caught us by surprise on the way down, but we vowed to have our cameras at the ready for our return. We all wanted a photo of the camels to show our children when we returned. 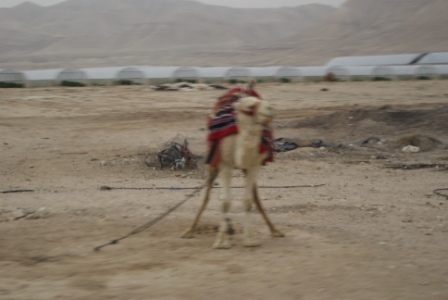 One lonely camel, whose picture is fuzzy because it was taken out the bus window at full speed. 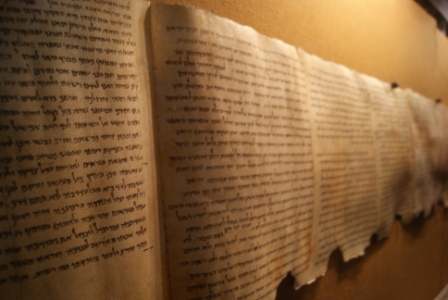 Our first stop was Qumran, where the famous Dead Sea Scrolls were discovered by a young Bedouin boy in a cave in 1947. Between 1947 and 1956, nearly 1,000 scrolls were found in nearby caves, preserved almost perfectly for 2,000 years. They represent copies of Hebrew Bible books, along with community rules and logs from the Essene community. 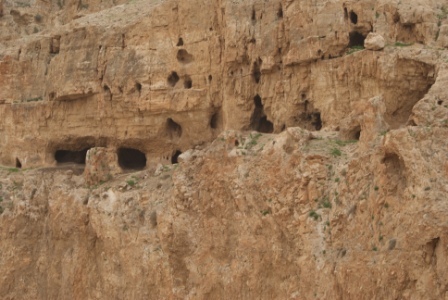 The scrolls have made major impacts on biblical scholarship, and it was fascinating to look out on the hillside and see the caves where they were found. Next time I see a note in my study bible about “Q4,” I’ll know that it refers to a scroll found in Cave 4, which I saw with my own eyes. 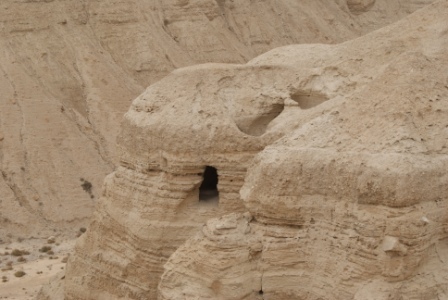 Qumran has since become a site of major excavations, uncovering the community life of the Essenes. The Essenes were a Jewish sect that existed from the 2nd century BCE to the 1st century CE. They chose to withdraw from the Second Temple practices and follow a stricter community rule which included common meals, ritual baths, celibacy and group living. Many think John the Baptist had some connection with the Essenes. The Qumran site has uncovered their cisterns, aqueducts, dining area, and many ritual baths, along with artifacts and Dead Sea scrolls that detail life in the community. It was fascinating to imagine a community living in the desert in such ascetic conditions. 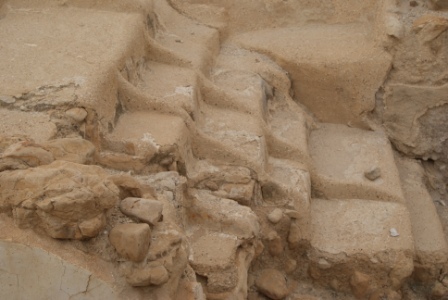 Steps for the ritual bath, divided into three sections. One for those unclean going in, one for those clean going out, with the middle section to separate them from one another. 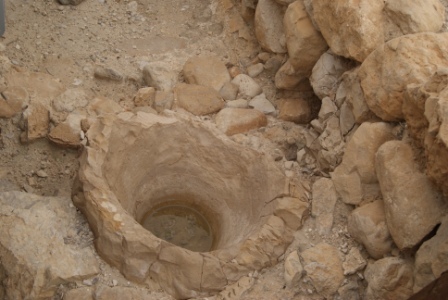 The remains of a first-century latrine at Qumran. From Qumran, we completed our descent to the shores of the Dead Sea, where we donned swimsuits and took a dunk in the famous salt and mineral-laden waters. Swimming in the Dead Sea was just pure fun. Each of us cast aside our concerns about body image or looking graceful, and just acted like children at the beach. Any hope of dignity soon disappeared when the knee-deep mud at the water’s edge caused most of us to fall in immediately, covered in the (supposedly beautifying) Dead Sea mud. The 28.5% salt and mineral content makes it impossible to sink in the Sea, but it also is challenging to get any parts of your body to stay under the water! As a group, we laughed and laughed as each of us tried to shift our weight and get our feet underneath us into a standing position, only to see them bounce to the surface again. Once we got the hang of floating, we even engaged in some synchronized swimming, much to the amusement of ourselves and our colleagues on the shore. Like our “polar plunge” in the Sea of Galilee, floating in the Dead Sea felt like the healing waters of baptism. Casting off any cares and concerns, I just let my body get covered in mud and float around awkwardly in the water. Our tour guide told us, with a wink and a smile, that a swim in the Dead Sea minerals will make you look 10 years younger. I’m not sure my skin felt that much smoother, but my heart definitely felt lighter from the joy and playfulness of the place. Check it out: no hands AND no feet in the water, yet still we float! How cool is that? After cleaning up and changing from our swim, we headed into Jericho (part of the West Bank). You wouldn’t think that the forbidding monastery built into the cliff cave on the Mount of Temptation (traditional site of Jesus’ 40 days in the wilderness) would also be a site of joy and playfulness, but when you have to take a cable car ride to get there, it has a certain amusement park feel to it. 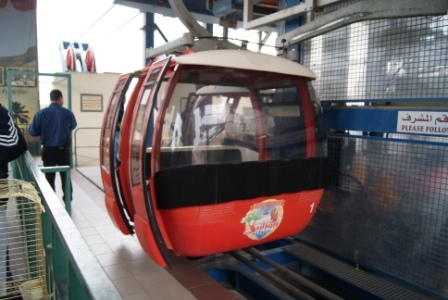 Our group piled into three cable cars to make the five minute ascent to the top. We laughed and took pictures of the amazing view, and someone even started a light-hearted Hava Nashira, with each car singing one part of the round. Can you see our destination? On the left, almost to the top of the mountain, the monastery hangs off the cliff. Waving and taking pictures and singing "Hava Nashira"
The monastery is only 350 meters above sea level, which doesn’t sound like much until you remember that you’re starting near the Dead Sea, which is nearly 1400 feet below sea level—so it’s actually a steep climb. At the top, the monastery itself hovers out over the sheer cliff face, looking over a series of caves that have served as hermitage sites for Christian monastics since the first centuries after Christ. We got our exercise with more switchback steps on the mountainside, but it was worth the workout to see the spectacular view from the monastery. On the right were the hillside caves, and on the left were the monastery cubicles built off the side of the mountain. Although this was first developed as a monastic site by the Byzantines in the 5th century, it was abandoned and destroyed and not rebuilt until the late 19th century. This site was not for those who are afraid of heights! Once we got to the top, we still had to climb all these steps to reach the monastery. Looking out from the monastery to the caves in the cliff. These are the kinds of caves Jesus would have spent time in during his temptation in the wilderness. You can't tell from the photo, but they are hundreds of feet up the cliff, nearly impossible to reach. Hanging off the side of the cliff, looking back at the monastery and the caves. After a cable car descent, lunch and a little shopping, we explored Tel as-Sultan, the site of historic Jericho. The signs all claim that Jericho is the oldest continuously-occupied city in the world, dating back at least 12,000 years. 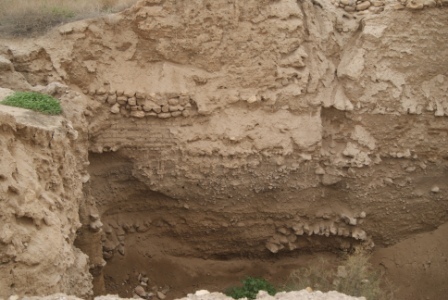 As we climbed the archeological site, we saw the remaining walls of mud brick dwellings from several periods before Christ, along with black layers indicating the city’s destruction. Despite the wealth of archeological information found in the city, there is no evidence of that the famous walls ever “came a-tumblin’ down.” The most interesting and impressive find doesn’t look like much in the photo, but it is a Neolithic tower, a stone structure built sometime around 10,000 BCE, probably for worship. It was amazing to stand on the hilltop and imagine that human beings had been making a way of life in this desert for millenia. 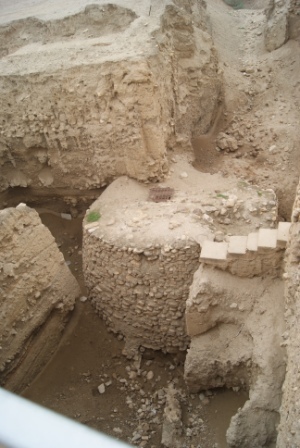 The circular stone tower at the center dates back to the Neolithic period in Jericho. If you look closely, you can see various layers of brick, and even the two layers of black indicating fires. 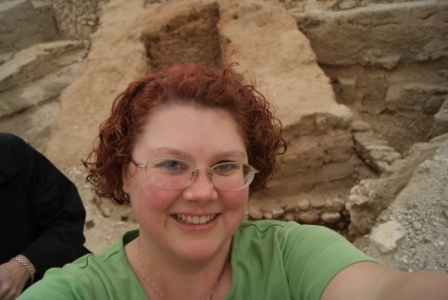 Me in Jericho, the oldest continuously-occupied city in the world, with mud-brick Bronze Age homes in the background. 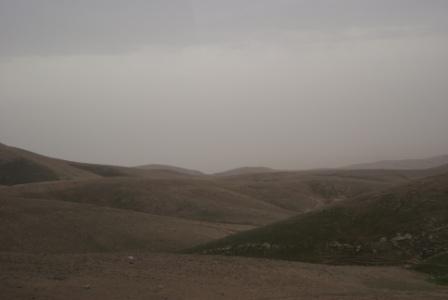 When we piled back into the bus to return to Jerusalem, the air was full of laughter and joy. 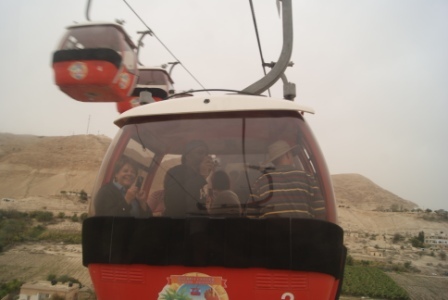 The tour guide teased us for our obsession with the camels, and we teased each other for rocking the cable cars, buying goofy souvenirs, getting stuck in the mud, and not losing as many wrinkles as we had hoped after our dip in the Dead Sea. We agreed that, even if the outside didn’t show it, we all felt younger at heart after our boisterous fun. Friendship, laughter, playfulness, joy—these are part of the pilgrimage experience, too. This day of recreation was just as holy as the days of serious contemplation, and we were re-created, renewed in joy and love. Camels! Look at all the camels! Oh little town of Bethlehem, how still we see thee lie. Philip Brooks certainly could never have imagined modern Bethlehem when he penned those lyrics in 1867, but today’s Bethlehem represented for me the meeting place of hope and fear, the place where everlasting light shone in dark streets. 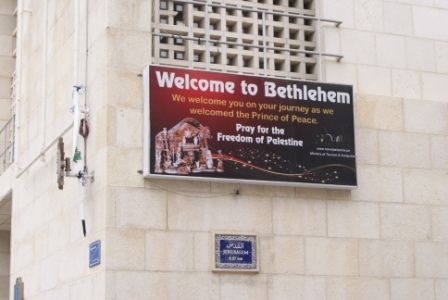 Today’s Bethlehem is in the occupied West Bank. 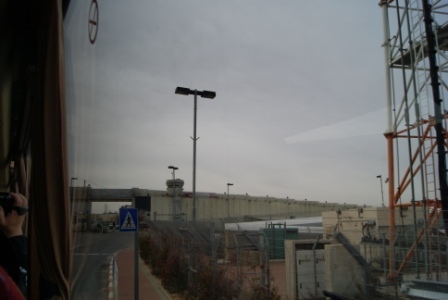 To visit the place of Jesus’ birth, we had to pass through the Israeli checkpoint and giant security wall erected to prevent the Palestinians from having access to their land or Israel. 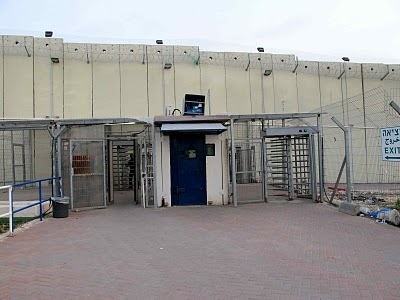 After listening to Noora’s story the day before, we had a chance to see with our own eyes the conditions of occupation. The security wall blocks all view of Bethlehem from outside, erasing its presence from the landscape. As tourists, we were not subject to the same scrutiny as local Palestinians, but we saw the long lines as we passed by the checkpoint. We saw the teenagers with machine guns looking warily at old men and young women with babies. We drove on a road built for the Israeli settlers, a road that Palestinians were not allowed to use to access their own towns, a road whose impassibility created a barrier that separated families from one another. The wall cut across the land like an ugly scar. Once we got inside the wall, we saw the passionate expressions of resistance painted on it. This is the town of Jesus’ birth. Two thousand years ago, Jesus too was born under an occupying army, cut off from his family by a Roman decree that sent them on the road to Bethlehem. 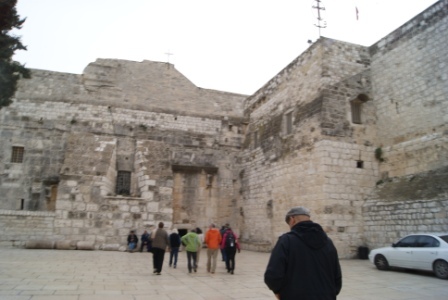 The Church of the Nativity, which preserves the traditional site of Jesus’ birth, is built like a fortress. It’s the oldest surviving church in the country, built by the Byzantines in the fifth century. It was only saved from destruction by the Persians because it had a mosaic over the entrance featuring the three wise men. Their image resembled the Persians themselves, so they left the church intact. 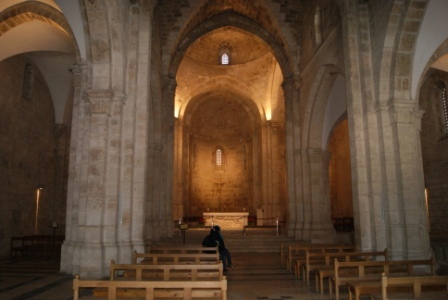 When the Crusader armies became the occupiers, they built major fortifications around the building, and expanded the church with new art and decoration. They even blocked up the doors so they were only four feet high, so that no soldier on horseback could enter in battle. 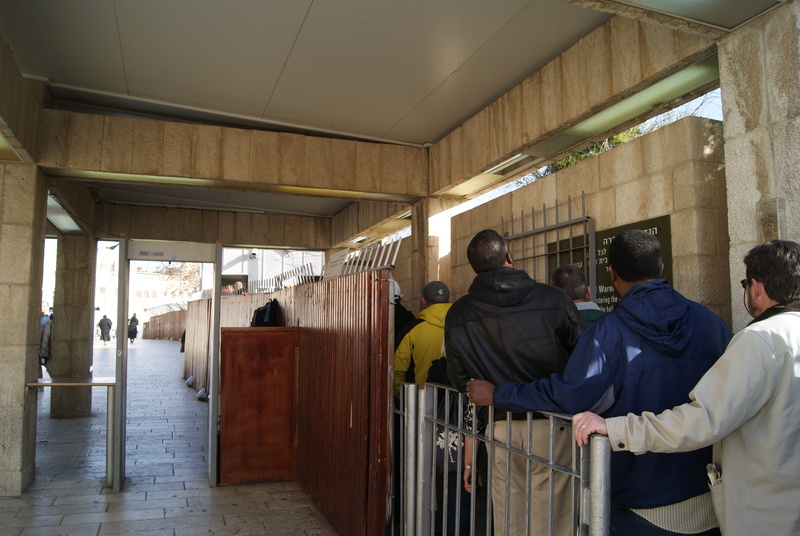 Jesus’ birthplace looked a lot like the checkpoint—one narrow entrance into the space behind the high wall. 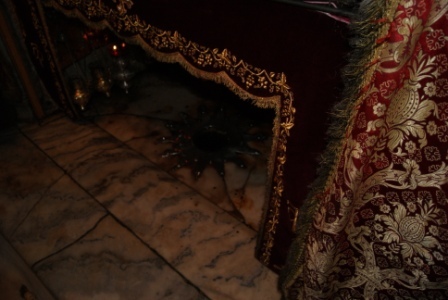 The church itself was dark, and the supposed site of Jesus’ birth was buried underground in a tiny grotto, laden with tapestries and candles and stones and silver décor. It didn’t feel to me at all like a humble stable. Like the Church of the Holy Sepulchre, it was oppressive with the weight of Christendom, rather than the light of the living Christ. 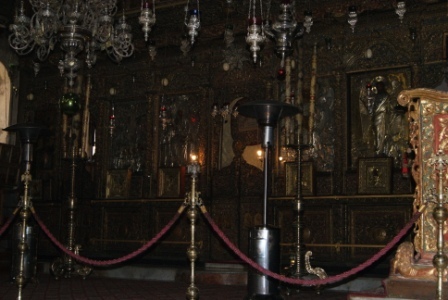 Beneath this decorative display is the traditional site of Jesus' birth. But the everlasting light does shine in the dark streets of Bethlehem today, bringing hope into this place of so much fear. The Christ-light is alive and well at Diyar, the Palestinian Christian organization founded by Dr. Mitri Raheb, author of I Am a Palestinian Christian and pastor of Christmas Lutheran Church in Bethlehem. We met with Dr. Raheb for an hour, and listened to his theological reflection on what it means to be a pastor in Bethlehem today. His words, his presence, his church’s ministries are giving birth to hope in Bethlehem today, and they inspired us with hope as well. Raheb himself was immediately impressive as a theologian with the heart of a pastor and skill of a visionary leader. I was captivated by his analysis of contextual theology for Palestinian Christians, who dwell in the land where it all began. He spoke powerfully of the deep losses sustained by the Palestinian people since 1948. The greatest loss, he said, was not the land—it was their narrative. They had lost their story, their continuity of worship from the time of Christ, their culture as a people. This, he said, was far more important to reclaim—and, thankfully, reclaiming it is not dependent on political liberation, change from the outside or the end of the occupation. That work begins right now. 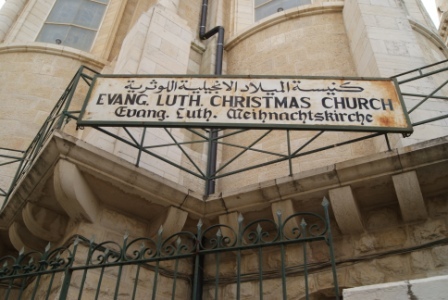 His congregation, Christmas Lutheran Church in Bethlehem, stepped out in faith to begin this work in their community, to become an outreach community by founding Diyar. As he told the story of Diyar’s founding, his church could have been anywhere, in any location. They were a small church, only about 220 people. When he first had a vision of launching a community outreach program, the congregation was hesitant. They were already struggling to pay the bills—how could they take on more? Weren’t they there to worship God first? How could they reach out to others when they were barely taking care of themselves? Shouldn’t they just hunker down and do their best to keep the church going through occupation? Instead of those questions of scarcity, they focused instead on the theological questions of mission: Where is God? Who is my neighbor? What is the vision of the best possible future, and how do you get there? Christ’s call to service prevailed, and God’s grace has been abundant. The sign for Diyar, listing many of the programs they offer. Founded in 1995, Diyar now serves more than 60,000 people a year (Muslims and Christians) through their programs. 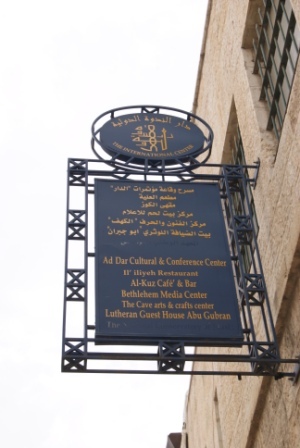 Diyar means “home,” and they describe themselves as a “Lutheran-based, ecumenically-oriented organization serving the whole Palestinian community.” They offer cultural programs and civic engagement training, health and wellness ministries (including a women’s sports league), higher education, and programs for children, parents and seniors. 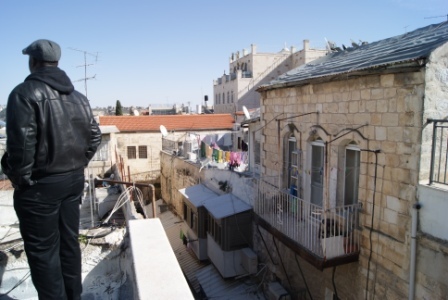 The congregation itself is still small (no one can move into or out of the West Bank, conversion is not a reality in Israel, and the community is predominately Muslim), but they no longer see themselves as barely holding on. Their ministry to the community has revived their sense of mission and their vitality as a congregation. Following God has given them a sense of freedom and purpose that no amount of oppression or occupation can suppress. 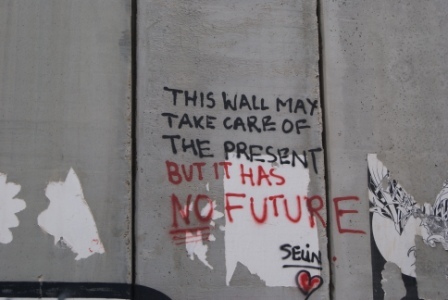 All the fortifications of occupying armies and all the might of empires, whether past, present or future, cannot keep hope from being born again and again and again in the City of Bethlehem. The hopes and fears of nations and their peoples meet in this tiny place. May God’s everlasting light continue to burn brightly there. 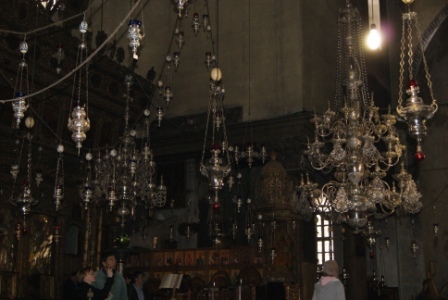 After the morning at the Holy Sepulchre and the early afternoon at Wujoud, I felt emotionally and mentally exhausted. It’s taken me all these days and hours of writing to begin to grapple with the information and experiences and revelations of that day. When a few members of our group planned to continue on to the Western Wall, in spite of the intensity and length of the day so far, I first thought they were crazy. I just wanted some time away to think and pray over everything we had experienced. In my writing up to this point, I have made sense of my feelings and had some time to process the day. On the day itself, and especially at this moment, I just felt worn down and broken apart by the experience. I wanted to huddle under the covers and cry. 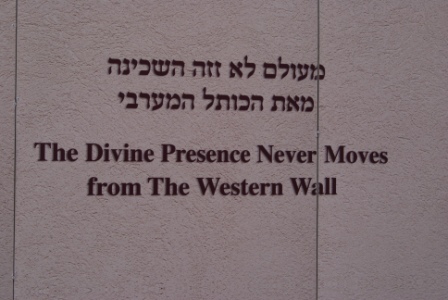 That’s when I realized that the Western Wall was exactly where I needed to go. Of all the sites in the Holy Land, the Western Wall has always been the place I most longed to see. My spirit is captivated by the idea of a place where people go to mourn. 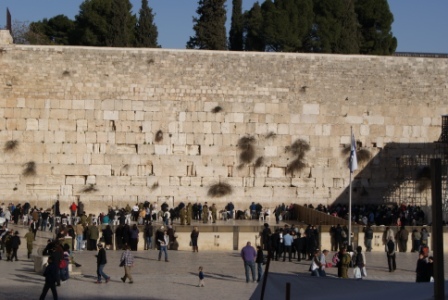 I first learned of the wall as the Wailing Wall, where the Jewish people mourned the destruction of the temple. I think there is a part of me that has never felt like I had permission to lament, like weeping was somehow a sign of my failure, or that it communicated to the people around me that they had failed me. Yet the truth is that much of what is broken in our lives and in our world deserves lamentation. The older I get, the more I think that the world needs our weeping as much as our rejoicing, calling out all that is broken, crying over the pain and sorrow that afflict us, and mourning for what cannot or will not be. The Western Wall, in my mind, was the place to take our sorrows, cry out to God, and know that God hears our affliction. I knew before we arrived that the Wall might not match my expectations, but I was still drawn there. The women’s side is only one-third the size of the men’s side, so it was crowded. There were women of every age—young mothers wearing their babies, old women with canes and walkers, and an enormous number of schoolgirls in uniform, each one bowing toward the wall with their faces buried in prayer books. I found my way to one of the plastic chairs, about three people back from the wall itself. As soon as I closed my eyes and opened my heart to God, the tears started to flow, just like I’d always imagined. Many others had tears on their faces, but no one was really wailing. Still, my sniffles and occasional sobs were drowned out by the mumbled prayers of the women around me and singing of the men on the other side, so I felt completely free to lament. My heart’s sorrows poured out before God, like crashing waves hurling themselves on the shore until they flattened out and returned calmly to the sea. I began with my personal lament for the day—for the exhaustion, and for my longing for home and family and church as I knew it. Then I cried for the pain we had seen that day—for the brokenness and fighting at the Church of the Holy Sepulchre, for the way that Christendom has piled gold on Jesus’ tomb rather than finding the living Christ, for the hardship of the Palestinian people in Noora’s community and the Jewish people praying next to me, for the convoluted and seemingly intractable conflict between the Israelis and the Palestinians, for all the wars of the world. When I had finished weeping for those things, I drew myself together to find the prayers from my congregation. I had invited anyone to send written prayers with me, and promised to pray for each one of them and tuck them into the cracks in the wall. 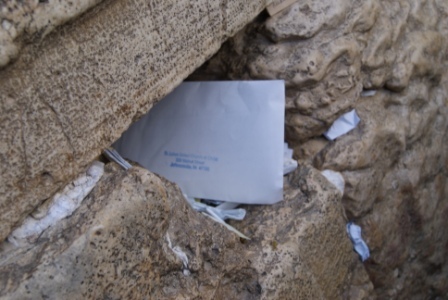 I had not opened the prayers at all until I pulled them out of my backpack at the Western Wall, and began to read the outpouring of people’s deepest concerns and longings. The tears began to flow again immediately. I have been the pastor of this small community for more than six years, and I have come to know each family very well. I know many of their pains and sorrows and struggles very well, and I love these people dearly. As I made my way through their prayers, I lamented for the brokenness that each one carries. When I finished the written prayers, I went through the list of names and imagined each person sitting in their place in the sanctuary. I cried for their sorrows, for their worries, for the heartbreaks of their lives. I wept because I loved them, and their pain deserved lament. I moved on to my family, my friends, myself—just letting the tears and the grief flow freely. I felt like I was leaving the grief in the place where it belonged, with all the accumulated sorrows of others. I wasn’t leaving it behind, but I was sharing it with God, laying it out plain, refusing to hold it inside anymore. Lamentation was liberation, and the Wall was everything I needed it to be—a safe place to weep, for as long as I desired. The prayers from my church, prayed for individually and placed together in an opening in the Wall. The challenge came when I was ready to leave. I made my way forward to the Wall itself, and found a hole big enough to hold the entire envelope full of prayers from my congregation. I noticed that the Jewish folks around me were walking backwards away from the Wall, as a sign of respect and deference for the former Temple Mount. I started to walk backwards away, keeping my eyes on the Wall, but my soul was ready to turn around. I wanted more than anything to turn my back on the weeping and face the world again. Backing up made me feel tied to the sorrow, to the longing, to the lamentation, rather than to the hustle and bustle of the people passing on the plaza. In spite of all that is broken in this pain-filled world, we have life and have it abundantly. As the Psalmist says, “Weeping may endure for a night, but joy will come in the morning.” I was ready to turn toward the dawn. I knew how to get to the lamentation at the Wailing Wall, but I didn’t know how to get out of it. As a Christian, my usual place of weeping is the cross, which always points to the resurrection. For those pious Jews around me praying at the wall and carefully backing away so as to keep it in their sights, what is the path from lamentation to joy? I know it is there (see Psalm above), but I don’t know the way. As I watched the schoolgirls backing away, I wondered how they turned mourning into dancing (again, a reference to the Hebrew scriptures). 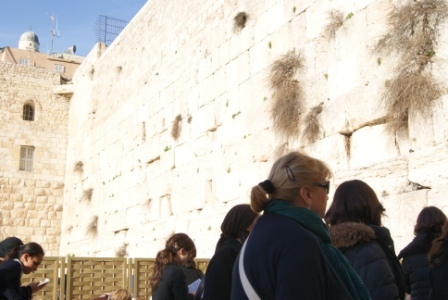 In deference to the traditions of the holy site of another faith, I dutifully backed away from the Wall, but what I really wanted to do was to place the prayers in the Wall, literally and figuratively, then turn and walk away without looking back. As important as it is to have a place of lament for this broken world, it is even more important to turn and face forward again with hope, to look toward the things of life and walk boldly into them. When I was finally able to turn away from the Wall and face forward again, I felt exhausted, but somehow lighter than before. All the angst and conflict of the day had been left behind, but I was spent. I made my way back to the hotel for evening prayer, thanked God for familiar comfort food like spaghetti on the hotel buffet at dinner, and crawled in bed by 8:30 p.m. It’s taken me three days of writing to finally work through the power of that one holy day. By the time we finished Hana Bendcowsky’s tour of the Church of the Holy Sepulchre, we were on information overload and sensory overstimulation. Thankfully, it was time to go to lunch. We didn’t realize, however, that our lunch was going to be an even more worshipful, insightful, emotional time—and would last well into the afternoon. Our lunch was hosted by Wujoud, an organization dedicated to remembering and honoring Palestinian culture and especially empowering Palestinian women. Turning off one of the crowded stone paths of the Old City, we entered a building that you wouldn’t know existed from the street. Inside was a small museum, but we went upstairs where we could smell lunch cooking. It wasn’t a restaurant, simply a small kitchen and a few tables set up for us in one room. The women in the kitchen were preparing a Palestinian dish called “upside down,” which was made of cauliflower and carrots and onions on the bottom, rice on top, cooked all together in one pot. The trick is then to flip the dish over and keep the rice standing in the shape of the pot—hence the name “upside down.” Our cook was a master, and it was both beautiful and delicious. Although all the meals we have had have been delicious (especially lunch, which is at a local restaurant, as opposed to breakfast and dinner at the hotel), this one was one of the best. Not just because of the good, homemade food, but because it was prepared with love and served with warm hospitality. The environment felt more like a church supper than a restaurant in a foreign country. We all treasured the space they had created for us and the meal they had prepared. After lunch, they invited us to tour the museum, but not before we met Noora Qertt, the director of the organization. Noora is a Palestinian Christian, and she has dedicated her life to preserving the culture of her people, empowering Palestinian women, fighting for justice every day, and living her Christian faith as a daily witness to peace. Her witness, her energy and her courage were awe-inspiring. Her organization has a collective of 550 women doing embroidery at home to sell in her shops and in collaboration with churches around the world. They have women learning to be professional chefs and jewelry-makers, and playing in sports leagues, along with many other programs. Noora Qertt sharing her inspiring stories. Noora told us about the building we sat in, which was a gift from the Orthodox church to her organization in recognition for all her good work. However, the building was falling apart when she received it, so she had to raise half a million dollars to restore it. Once she had the building, she went to people’s homes and looked through the old things and furniture they had representing life among the Palestinian people, then she talked them into donating it to the museum. The walls were covered with old photographs of Palestinian life before 1948. Downstairs, there was a room divided in two halves, like two Palestinian homes, one wealthier and one poorer, with a hearth and furniture and food and the things of home. They had amazingly beautiful hand-embroidered clothing, baptismal gowns and hats, along with furniture and woodwork from Palestine’s past. The name of the organization, Wujoud, means “existence” in Arabic. Noora’s work, first and foremost, is to help the world hear from the Palestinians: “we exist.” They are a real people, with a real heritage and culture and faith—some Muslim, some Christian. Noora had worshipped alongside us just a little while earlier in the Arabic Orthodox Chapel at the Church of the Holy Sepulchre, where she has worshipped her whole life. Regardless of your opinion on the State of Israel, its current actions and history, or the way forward, Noora made powerful claims about the history of her community in this place. 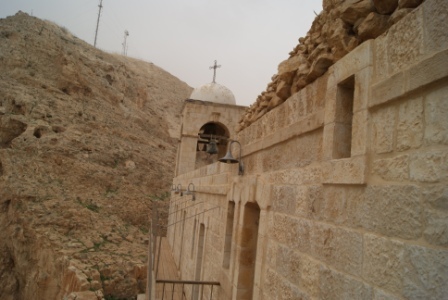 Just as an example, she said that when she gave a lecture once, someone asked her, “How long have you been a Christian?” She answered curtly, “Since Pentecost.” The Christians in this area claim their roots worshipping Christ here since the first century. View from the roof of the Wujoud building, looking down at the street. That story was one among many Noora told that showed her courage and refusal to be diminished, in spite of occupation. 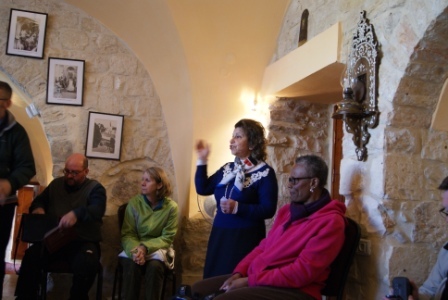 She told the story of a building project that her organization was doing in the West Bank, building a gym or school or other community building. The engineer was stopped at a checkpoint and asked to strip down. He refused the command in order to maintain his dignity, choosing instead to return to Noora with his resignation from the project. Instead of letting him go or telling him, “this is just how it is,” she asked him to accompany her back to the same checkpoint. When he pointed out the officer who had made the demand, Noora got out of the car and began walking up to him. Every gun was trained on her, but she showed that she was carrying nothing and kept moving slowly forward. She approached the officer, and told him about what had happened. She did not beg him, she did not plead with him. 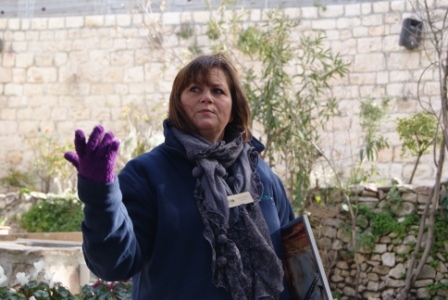 She explained that her organization and what they were doing in the West Bank would help eliminate violence by giving productive work and community, and she needed her engineer to be able to pass with his dignity intact. The officer was unmoved. She appealed to his humanity, “I can see you are not this man with a gun. You are a faithful man with a family back home that you want to return to. Tell you what I’m going to do for you. I’m going to pray for you. I’m going to pray that you get to go home from here safely, back to your family, that you never again have to pick up this gun and work at this checkpoint anymore, and you get to return to your life again.” With that, the officer relented, “Go, go,” he said, and let her and the engineer pass through smoothly. Noora told many other stories like that one, and what I heard in all of them was how dehumanizing the Palestinian occupation is, not just for Palestinians, but for the Israeli Defense Forces guarding the checkpoints. Noora’s story was an account of the everyday work of making justice and peace. It was not about solving the thorny mess of the Israeli/Palestinian conflict, it was about restoring the dignity and humanity of her engineer by restoring the dignity and humanity of the soldier, using her body and her prayer as a path to one moment of peace and justice. I have long preached that peace and justice begin with each one of us acting in the world with love and compassion, but Noora’s stories gave me a whole new appreciation for what that might look like. In my daily life, how do I restore dignity and humanity to those around me, so that we can approach one another in a just relationship? In situations where I am powerless, do I work to reclaim my own humanity by speaking to the humanity of my antagonist? In situations when I am powerful, how do I restore dignity to those who are powerless? Would I have that kind of courage and imagination to act outside of the rules, and thereby change the situation altogether? Sitting and listening to Noora was like being in church, and I felt the Spirit in our midst. Noora’s work and her example made a profound impact on me. The hour at lunch and hour listening to her stories felt more like church than anything else we had experienced so far that day, on what was supposedly the most holy site in all of Christianity. Her faith inspired her to act with love even for her enemies, to be courageous in the face of great danger, and to refuse to let anyone but God tell her who she is and what she is worth. I am grateful for her witness.